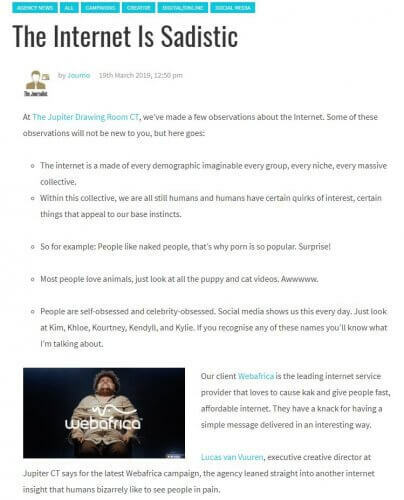 We love the internet here at Webafrica, and we’re always looking for ad campaigns that embrace it in all of its forms. After some interesting research and a few good brain-storming sessions with Jupiter Drawing Room and Sketchbook studios – we released our “shocking” new ad campaign which sees Webafrica Bill being “tortured” for information- which of course he gives up in the first five seconds of the ad! He then goes on to reveal every other secret about himself we never wanted to know, including some interesting information about a creepy-crawly? What we love about campaigns like this one is the fact that the vast majority of viewers watched well past the point where they could “skip” the ad. It seems everyone wants to know what Bill will tell us next. Please note that no-one was hurt during the making of this ad, although we did laugh until our faces hurt! What is the big secret? The fact that Fibre is cheaper than ADSL – with Webafrica. 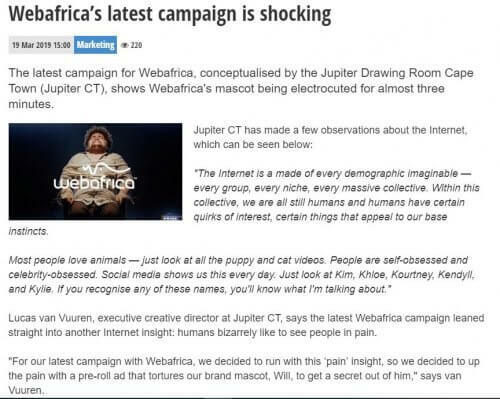 The Shocking Webafrica ad is gaining some traction and plenty of attention online. Whatever your views on our “shocking” ad may be, one thing remains true (and it’s probably the most shocking thing of all) – Webafrica Fibre is, in actual fact, cheaper than you average ADSL package. So why not visit our Fibre page now and find out how we can help you save by switching to Fibre? 4K Streaming – what is it? Why is it cool? Where can I find content to watch in 4K?